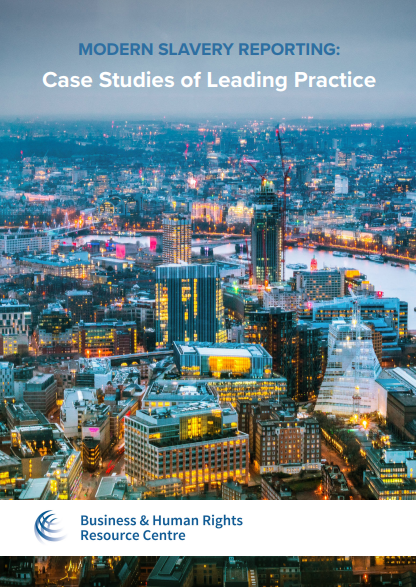 string(1126) "Resource Centre > Uncategorized > Modern Slavery Reporting: Case Studies of Leading Practice"
This briefing provides examples of good practice found in the thousands statements made under the UK Modern Slavery Act. It aims to inform government and investor engagement with companies around modern slavery. The UK Modern Slavery Act (the Act) is the first law that requires companies, from around the world, to report annually on the actions that they are undertaking each year to tackle modern slavery in their operations and supply chains. This reporting requirement looks to increase transparency on companies’ efforts to identify and mitigate their modern slavery risks, and their improvement over time. Statements made under the Act provide stakeholders – including investors, business partners, prospective talent, and civil society – with the information that they need to assess which companies are mitigating their risks, and which appear reckless. However, transparency, whilst necessary, is insufficient on its own to protect vulnerable workers from forced labour. The company should demonstrate due diligence to mitigate risks and ensure that there is remedy when mistakes are made. Equally, stakeholders should use the information provided in modern slavery statements to challenge and encourage companies to take bolder steps to eliminate slavery from their operations and supply chains. The purpose of this briefing is to provide examples of good practice found in the thousands of compliance statements now available on the BHRRC’s Modern Slavery Registry and their benchmarking of the FTSE 100 companies’ statements. The briefing also highlights serious gaps where few or no companies are performing well. The authors hope that the best practice and gap analyses will encourage informed engagement with companies by investors, civil society, and governments; and facilitate informed reflection within companies regarding their next steps to eliminate modern slavery from their operations and supply chains.